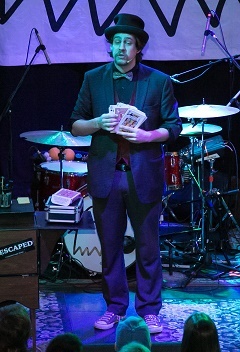 Cincinnati Magic Shows, Comedy Magic & Hypnotism Shows! Cincinnati Magicians perform all over. We're happy to travel to anywhere! We often perform in Cincinnati, Dayton, Columbus, Lexington, Louisville, and Indianapolis. We offer strolling magic and magic shows. We perform for any age and any event. We have comedy magic shows that are great for coroporate holiday parties and shows that are great for schools. Just tell us about your event and we'll be glad to help. We have performed thousands of shows. We perform comedy hypnotism and comedy mind reading shows for company holiday parties and we are often asked to provide strolling magic for conferences. What ever your event we're happy to help. 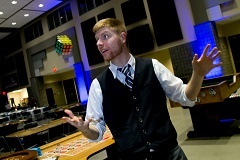 Atmosphere strolling magic, great for parties, or conferences! Great for schools shows, and public events! Awesome for Conferences! Great at keeping people at your booth and makeing them laugh! Classic Magic Illusion Show! Awesome for Halloween! He'll read your mind! This is a great show! Great for After Proms, Company Holiday Parties, Corporate Meetings! Hypnotist Dan Lucket will show you a great time and may even cure you of bad habits! 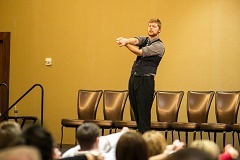 Dan is funny and creative in his approach to hypnotism! Your after prom or college students will thank you! I wanted to take this opportunity to thank you for bringing Dan Luckett to the Let Us Never Forget Banquet at the Oasis this past Saturday. Dan, a true professional, was a pleasure to work with. Besides his timely arrival and cooperative nature, he entertained the audience beyond my expectations. Dan did a great job in a difficult setting. He impressed me very much and I will look forward to the opportunity to work with him again. Dave, you all did a great job and for that I am forever grateful.